Finally, The Genuine 20" iMac G4 - All-In-One Sandy Bridge Mod is complete. 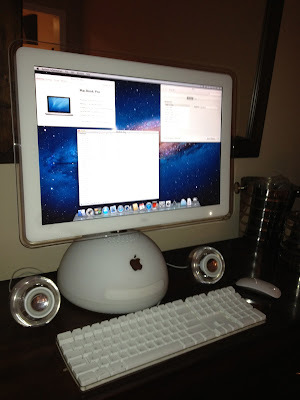 This is as close as I believe its possible to come to modernizing the original iMac G4. It runs Lion, Mac OS 10.7 with only S3 sleep not working (S1 sleep works fine). Wifi (using the original antenna embedded below the white plastic dome) and Bluetooth (via dongle on the back) work perfectly. The power indicator and microphone on the Monitor Casing are also working. The internal DVD burner can be ejected from te keyboard. There is a powerbrick which plugs in via 4 pin connector to the center port on the rear of the iMac. A Griffin iFire is used to connect the original Apple Pro Speakers. The CPU fan is very quiet except under heavy loads. This is the culmination of really all my previous mods and I'd like to thank all those who have helped me all the way and encourage all those who are thinking about resurrecting their iMac G4s to do so. THANK YOU! Thank you for all your hard work and inventiveness! We will be trying this! Happy New Year! Thank you very much and please let me know if anything in my guides can be improved upon or is not clear. Thanks for reading and I'm happy to answer questions. Wow, i've been reading your blog intently for a while. Well done, what an excellent mod, and what valuable information you have. I'm tempted to do this on my g4 10 too, however i dont know if i can get rid of the original innards, but it is getting damn slow. I had an idea, i dont know about its feasibility, which is why I ask. Would it be possible to splice the video cable so that I can switch between the original motherboard and an external dvi source. As in make a cabe that fits between the mobo and original monitor cable that can have a physical (or digital (arduino?)) switch between sources. And even if that is possible, the problem I think would be having to need the original mobo on, whilst on external source. Either way. Congratulations again, you and slippery skip are my too favourite modders. JBerg thankyou for the reply, dont worry ive opened my g4 many a time, i'm quite experienced in building and modding, ill have to post you a pic of my bakelite pc, and a wacom screen toshiba I built into a book. Hopefully my next2 projects will be iMac G4 with external video and a homemade art deco wooden iMac with hackintosh insides and the neck off a broken G4 20. But, I digress. I did indeed consider pcb route, but definately on a riser - I have a 3.5 inch sata hd with IDE converter where the DVD drive used to be, so I have space (maybe) there. I would also like to have the video connector be under or pop out with the disk tray "tongue". Im glad you think it's possible, and the part number would be much appreciated. I think with this project... If i succeed with minimal modding necessary, i.e. pop in a pcb, have a cable popping out of somewhere without modding case, I can upload the design to a custom pcb fabricator so others can try. I like the idea of preserving a relic of both design and architecture, where it can be used as a file server, and connecting my macbookpro or my gaming rig. When I say architecture, I think it's of note not just because of it's looks, but because as far as I know.. the only PC with a round motherboard and the only pc I have ever seen with both DIMM and SODIMM ram. Anyway, Glad you enjoy your projects. PS, I may be able to help you with a new about this mac and system information where the pictures are replaced with a G4 and where the model is "correctly" identified. 1)I have read your many concerns with the ITX heating/space issues. I'm assuming if I were to go the method of a mini-itx at the bottom, I would have to remove the optical drive. Correct? 2)If I were to go for an all-in-one ECX mod, similar to your latest, would it be easiest to obtain a 20" g4 and replace the LCD with a 20" cinema display? Could I utilize the original frame for the iMac? What modding is required? 3)I'm astounded by your maintaining of the ports at the bottom. How did you wire and or achieve this with the ECX at the top? Could you possibly give me a link to the process of this, or provide pictures/a description? 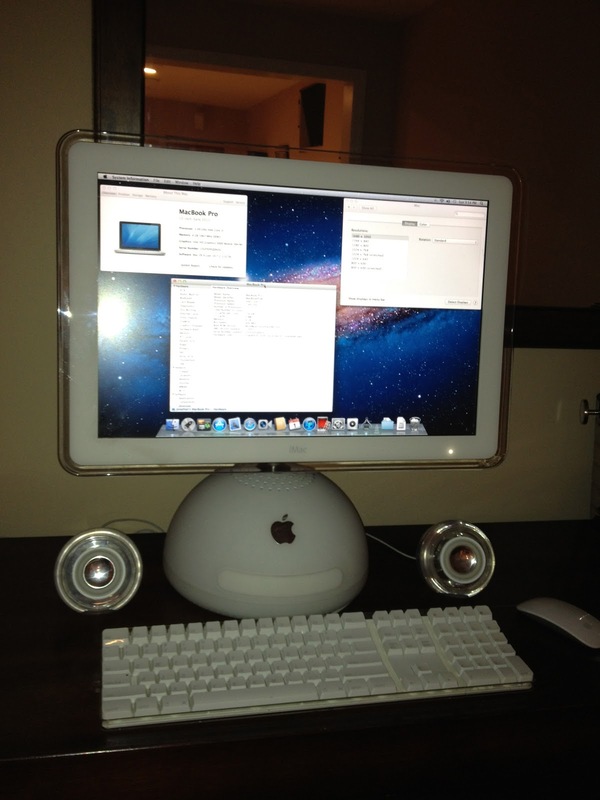 I currently own a 17" iMac G4 running smoothly with MintPPC Linux. I was convinced that I was going to mod this but after realizing the limitations of the monitor/arm I think I will keep it as is, maybe even reinstall Lion eventually. I am constantly searching for a 20" so I can complete my all-in one mod by 2013. I am just so new to this and your blog has been a great help so far. I'm just not sure if I am capable of achieving anything close to yours without help. Kazaii, I was just replying to another commenter when I saw your comment appear. Id be happy to answer your questions. 1) yes, there is very little clearance below the DVD and use of a mini itx (even a low profile on) will necessitate eliminating the optical drive. Now a mini itx does fit and as long as something physically fits it is possible to use it. However it does have to fit at an angle and some of the ports can be blocked. The other concern a you mentioned is heat. This is by no means insurmountable but it does require compromise. Meaning you have to limit what is placed above the mini itx as that will impede airflow, meticulous wire management, and a focus on cooling. When I tested a first generation sandy bridge core i3 mini itx that I stuffed in the base, I had CPU temps around 85 degrees with minimal load. You should consider some kind of liquid to fan cooling solution such that the heat is transferred to the top of the dome. The ECX offered for me everything I was looking for, so this was an easy decision. 2) I did the 20" 3 ways. Cut a hole in the back of an actual cinema displa and put it wires through the neck. This requires a lot of wok and does not look exactly like the native iMac. I also used the LCD controller from a cinema display, this works great but does require soldering and modification of the neck. 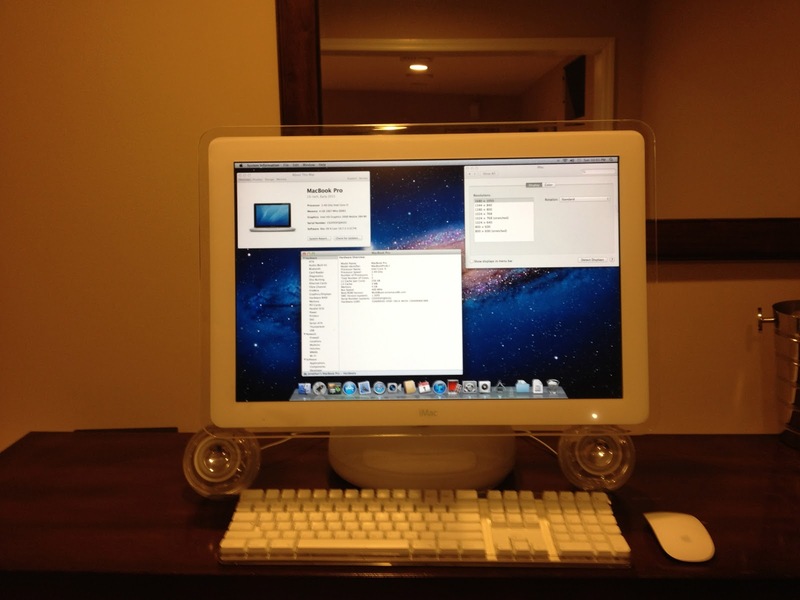 But this is really stable as it is an apple cinema display in iMac clothing. The easiest and least expensive is to use the native panel with the DVI connector as in my latest projects - no neck alteration and minimal soldering. 3) while you can cut off the ends of the original mobo and solder wires onto the remaining mobo connectors, I find this tedious. I simply used extenders. I used an Ethernet extender, a male to female 3.5mm audio cable, and had 4 motherboard USB to female USB A cables. Then place them where you want and fix in place. I actually used hot glue this time, but I used a hardening clay previously that I liked. If you look back in my blog to the first ECX board 20" mod I did, I go through the port creation process. It's not hard. I'm happy to help - if you need anything, just ask. Thanks so much Jberg. I was just wondering about the itx solution because I much prefer the chips available vs the mobility chips. I was also thinking of possibly fitting in an H50 cooler, to replace the stock cooler. In terms of the LCD, using the last method you stated, would it be possible to mod the 15"? Could I still utilize the DVI connector? I would still probably search for a 20" due to resolution and size issues. I'm glad that you assure me that your latest build is the easiest, in a sense. 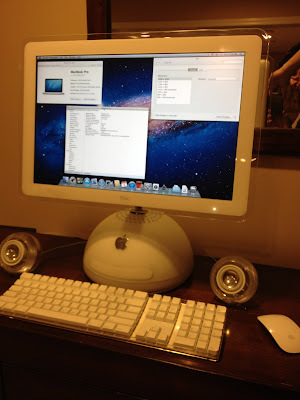 Having an iMac G4 with macbook pro specs is fairly impressive and would hopefully breath life into the last amazing iMac for another good 10 years. I'll update you on my project as I continue, hopefully finishing by 2013. I'm unsure if I will mod my current 15" because it's very useful as a low power consuming web, ssh and ftp server. Yes, the 15" can be modded in the same way. I have never done it, but the modder pgee allowed me to pose his pinout. Its one of my fairly recent posts. Just want to say that the area within the faraday cage is smaller than many people realize, even more so in the 20" which has extra weight in the form of metal protrusions on each side of the drive. Look inside and make scale models before purchasing any expensive equipment. I have used the H50 in the past and while its a good cooler, the 120mm vent will not fit in the 92mm iMac fan "groove" at the top of the dome. Hello sir. Really interested in your progress with the iMac G4. This is probably going to sound like a very cheap way out, but I don't think I would have the the to give a project like this the love that it needs. So here comes the question I am sure you have been asked before......would you ever consider making one of these if someone covered the cost of parts and labor? I totally understand if this is not something you would be interested in doing, but keep the material up and I shall give it a try instead. Thank you for whatever feedback you may be able to offer. Keep up the good work. P.S. Just bookmarked your blog. Great inventions. I love you gadgets. I can hope something more. I appreciate the offer, but selling completed mods or parts of mods is not something I really want to get into. The reason for this is that the parts are somewhat special order and its labor intensive. So we would be talking about a lot of money. When someone purchases something for that kind of money they should expect reliability and tech support neither of which I can guarantee or want to have to worry about. Remember, this is not exactly how apple designed it to work and some of the parts here are over a decade old. So if one of he backlights burns out a week after I sent it, what happens. If the 3rd party pico PSU I put in it is defective (which happens often) and it lasts only a month, then what. What if one of my solders fails during transport? I hope you understand why I want no part of this. JBerg, you're the man! If I ever get out of school, I hope to catch up with your recent builds and get them going myself. This is the same guy from the other Anonymous comment. Completely understand. Having a job in the tech industry I understand the issue entirely. No offense taken here. Looks like I need to get my hands dirty pretty soon. Once again thanks for the info. Cool Modding. You think you can mod an iMac G3? Thanks. I have thought about modding a G3. I just don't like working with CRTs (thousands of volts). I would probably use an lcd replacement though this would may it somewhat inauthentic. But it's def something I'm considering in the future. Is this possible with a 17 inch? Thanks for the hard work and for sharing! Can't seem to find the KEEX ECX 6100 motherboard. I searched NewEgg, Amazon, eBay, and Google Shopping with no luck. Any thoughts or suggestions for alternatives would be appreciated! This form factor is not mainstream. The Quanmax boards such as the KEEX line are available directly from quanmaxusa or from a licensed distributor such as sliger.com. There are other manufacturers with similar boards such as portwell, global American, and ibase. But the only one I have used is the Quanmax. I am using such type of computer with all types of latest technology. Along with that I have also purchased its accessories like monitor arm and cpu holder not only to protect it from dirt and dust but, to increase the productivity and to save extra space in my office. It is available in different styles and colors. You could also download and install tumblr.com/ snapchat application for COMPUTER, Official Website snapchat app for android, snapchat Snapchat Download For PC & Smartphone (Android) application for iOS, snapchat Snapchat application for mac etc from right here. This snapchat Snapchat APK application is currently obtaining tremendous. choose the one that you want to set up Kodi on.Kodi App Afterwards Drag and also go down the IPA documents in Cydia Impactor. check this site The IPA file you downloaded from the links given above. Kodi Download If the links are not functioning then please comment listed below and I will update them.